I’m on a Shanghai train in my head at the moment as I found out last week I get to go back to China for the month June (and maybe a little longer) from Chengdu to Chongqing, Beijing to Shanghai, Shenzhen to Guangzhou and finally Hong Kong thrown in there for good measure too. I’m sure there’s somewhere else I’m going to(?). Needless to say I’m excited as I’ll get to see my Shanghai family again and also re-acquaint myself with some of my favourite things out there, including it’s yum-tasty food…which brings me onto the online series by Eddie Huang. A restaurateur, foodie, chef, food personality and journalist, Eddie works for VICE producing the documentary series ‘Fresh off the boat’ where he gives a real, urban and honest discovery take on how food feeds and drives cities across the world. This month, he went to Shanghai. He is in a word refreshing after watching certain TV series with “popularised” and in part stereotyping chefs on the BBC (et al). You know the shows I’m talking about. So watch him, enjoy his character, his edge, his commentary, as he indulges in the delicacies of my other home. 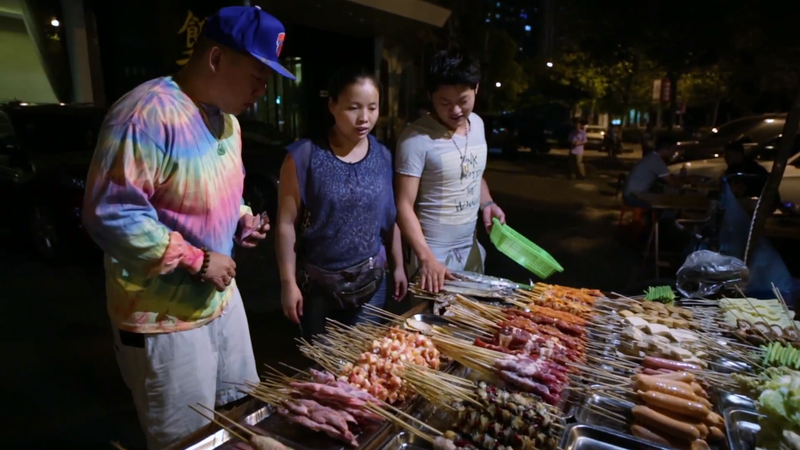 In the first part of ‘Fresh Off the Boat – Shanghai’, Eddie ventures into the heart of the city where he meets with Qiuxiang Wang, a humble street food vendor working to live in the city on her own terms. He spends time in her home, where she’s constantly making grilled skewers, grabs a midnight snack at a popular nighttime market, and gets a glimpse into what life is like for those trying to keep homegrown markets alive. In part two, he travels around the city with popular food writer Jenny Gao, where he starts his day with some poop-infused coffee, throws down in a good, old-fashioned cook-off, and discuss how attitudes towards food have changed in China since the Cultural Revolution. In part three and the final episode, Eddie spends his final day eating some quality breakfast dumplings, going undercover at a bootleg mall, and enjoying classic Chinese-American food in Shanghai while discussing what it was like growing as a Chinese-American in the USA.